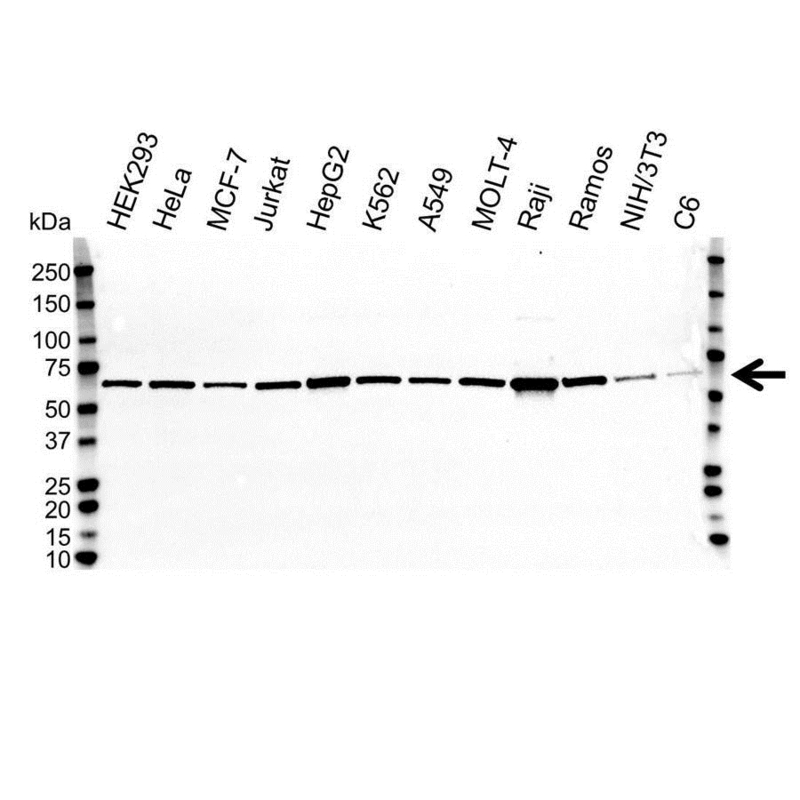 Heat shock protein 60 antibody recognizes mitochondrial 60 kDa heat shock protein, also known as 60 kDa chaperonin, HSP-60, Hsp60 HuCHA60 Mitochondrial matrix protein, or P1 P60 lymphocyte protein. The antibody has been extensively validated for western blotting using whole cell lysates. Mouse anti Human heat shock protein 60 antibody recognizes human heat shock protein 60 (HSP60), a member of the highly conserved chaperonin (HSP60) family, expressed abundantly in the mitochondrial matrix and is closely related to E. coli GroEL and plant Rubisco binding protein chaperones. Heat shock proteins are a group of heat- or stress-inducible proteins which act as molecular chaperones and as essential regulators of cellular processes, including protein folding. HSP60 acts in conjunction with the co-chaperonin HSP10, and is important in the refolding and transportation of proteins from the cytoplasm into the mitochondrial matrix, and also involved in the replication of mitochondrial DNA (Höhfeld et al. 1994). Mouse anti Human heat shock protein 60 recognizes human HSP60 as a single band of ~60 kDa by western blotting under reducing conditions in multiple cell line lysates. Anti heat shock protein 60 antibody detects a band of approximately 60 kDa in Raji cell lysates.